Recognizing that last Friday’s blog post about the digestive system of vultures, Vulture Dining--or perhaps just the thought of a vulture’s menu--might cause indigestion, I thought I’d offer you several vintage elixirs. You’re likely familiar with Phillips Milk of Magnesia, which dates from 1872, Pepto-Bismol, 1901, and certainly Alka-Seltzer, 1931, but those in today's addendum may have escaped your medicine cabinet. 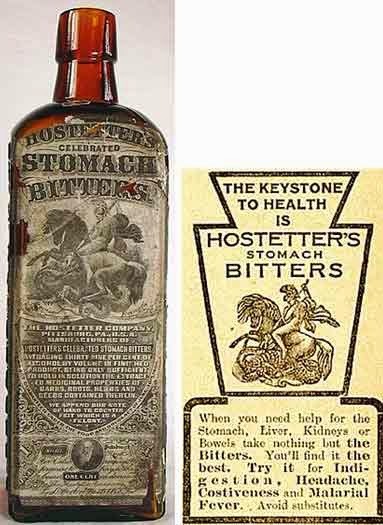 Hostetter’s Celebrated Stomach Bitters was the keystone to health when you need help for the stomach, liver, kidneys or bowels, not to mention headaches, costiveness [constipation] and malarial fever. Originally formulated with about 47% alcohol by Jacob Hostetter and produced in large scale in Pittsburgh by his son David beginning in 1853, the popular tonic sold for over a century. During the Civil War, it was a positive protective against the fatal maladies of the Southern swamps, and the poisonous tendency of the impure rivers and bayous. 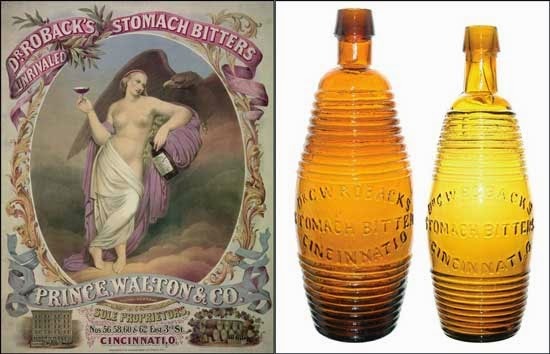 Dr. Roback’s Stomach Bitters, produced in the mid-1860s at the U.S. Proprietary Medicine Co., Cincinnati, Ohio, was good for all derangement of the stomach, biliousness, liver complaint and general debility. Reportedly, Dr. Roback, who was neither doctor nor Roback, had tried farming then sales and escaped debtor’s prison in his native Sweden. In the US as Dr. Roback, he sold horoscopes, galvanic chains to cure worms in children and love powders and founded an astrological college before marketing stomach bitters. 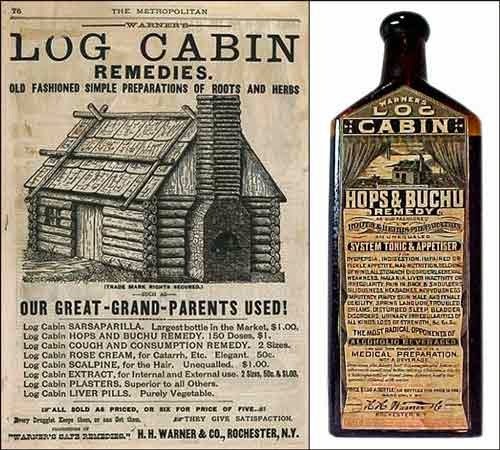 Hulbert H. Warner’s Log Cabin Hops & Buchu Remedy was advertised to cure a long list of maladies--belching, indigestion, impotency, liver inactivity, troubled dreams and more. Introduced in 1887, the Log Cabin Remedies supplemented Warner’s line of Safe Cure patented medicines, begun eight years earlier and successful enough to warrant offices in Canada, Europe and Australia. The Rochester, N.Y., home office remained open until about 1944. 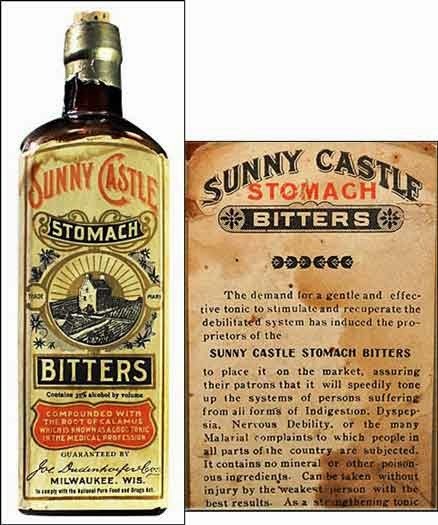 Sunny Castle Stomach Bitters would speedily tone up the systems of persons suffering from all forms of indigestion, dyspepsia, nervous debility and malarial complaints. The tonic was produced in Milwaukee, Wis., in the 1912-1918 time frame, apparently by Joseph Dudenhoefer, whose name appears on the label. Jacob Dudenhoefer, possibly Joseph’s father or a brother, came to Milwaukee from Germany in 1860, worked selling wines and liquor, and then established his own wholesale wine and liquor company. 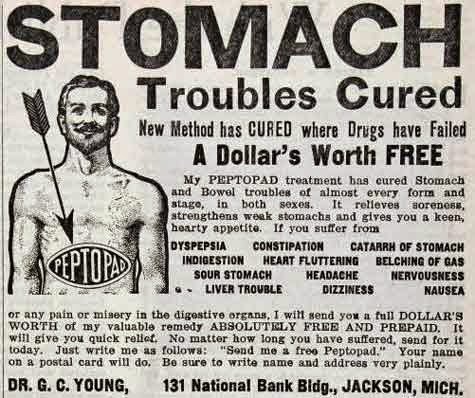 Dr. G. Campbell Young’s Peptopad Stomach Treatment, sold from Jackson, Mich., in 1907, was certain to cure stomach and bowel troubles of almost every form and stage, in both sexes. Unfortunately for Dr. Young, there was a new Pure Food and Drugs Act. The US Congress House Committee on Interstate and Foreign Commerce didn’t buy the idea that a plaster worn over the skin could be effective. 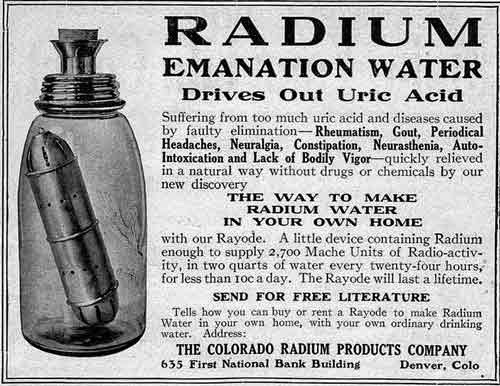 Rayode was one of 60 or more radium emanation water devices produced in the 1920s-30s. In addition to being quack cures for just about everything, those that actually had radium, which is highly radioactive, or produced radium’s decay product, radon gas, were downright dangerous.